Earth Aware Editions, 9781683835844, 224pp. Silent Kingdom reveals the world beneath the waves in an ethereal collection of black-and-white underwater photography. Through stunning black-and-white images, award-winning photographer Christian Vizl uses a masterful control of light and shadow to portray the creatures of the sea as they are rarely seen, at home in the ethereal world beneath the waves. From capturing the ferocity of sharks to the playful dance of dolphins, Vizl turns aquatic creatures and marine seascapes into visions of sublime grace and beauty suspended in time and space. With each turn of the page, venture deeper into the one realm in which humans do not reign and discover an unforgettable world that few have ever seen. Though the ocean covers over 70 percent of planet Earth, over 80 percent of that vast wilderness remains unexplored. As human activity begins to impact these once-untouched regions, it is more important now than ever to acknowledge both the beauty and value of our seas and the necessity of preserving one of the last true wild frontiers of our world. 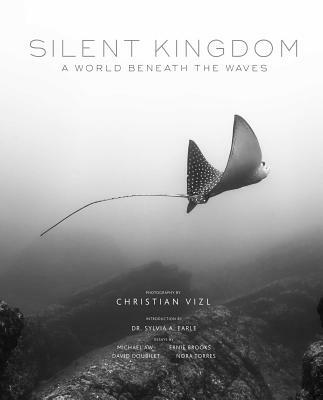 Silent Kingdom is both an ode both to the beauty of the ocean and the magnificent creatures that inhabit it and a call to action to preserve the fragile underwater world of our planet. Ernie Brooks is a trailblazer in the underwater black-and-white photography world. He was the president of the Brooks Institute of Photography for thirty years and has been featured in galleries around the world, won numerous awards, and been published in dozens of outlets. Michael Aw is an author, explorer, and conservation photographer. He has won more than sixty-five international photographic awards and has been named as one of the world's most influential nature photographers by Outdoor Photography. NORA TORRES is a member of CODEMAR, a non-profit Mexican initiative that brings together representatives from throughout society with the objective of protecting the natural wealth of Mexico's marine ecosystems. For more information visit www.endefensadelosmares.org. Dr. Sylvia A. Earle is President and Chairman of Mission Blue. She has been called Her Deepness by the New Yorker and the New York Times, Living Legend by the Library of Congress, and first Hero for the Planet by Time Magazine. She is an oceanographer, explorer, author, and lecturer. David Doubilet is a National Geographic photographer, has published numerous books, and has won dozens of prestigious awards including the Lowell Thomas Award and the Lennart Nilsson Award in Photography. He is a member of the Royal Photographic Society, International League of Conservation Photographers, and the International Diving Hall of Fame. "That we can, and should, revel in his photography should also remind us that the oceans are ailing, polluted with plastics and struggling with ocean acidification and warming." "Silent Kingdom is a breath of fresh air. The photography work is exceptional and demonstrates a master’s touch. Christian Vizl shows us his unique style, and it shines in this book. The included essays are thoughtful and timely, even if we did nitpick about how they flow as part of the book. There are many images in this book that will blow you away, and those alone are worth the price of admission."